It's been a funny old week - the tiredness is starting to make me really grumpy now and the sickness just won't go away. It's weeks 8-9 so hopefully it won't last much longer - I should be headed for the 'blooming' stage at week 12! It seems a long way off at the moment - what with the greasy hair, spots and for some reason really dry hands - the darker side of pregnancy! Mister A has taken to kissing the baby (mummy's tummy) before he goes to sleep at night although yesterday he said "Daddy, lift your top up - I want to kiss the baby" Chris was not impressed - I however, was rolling around on the floor in stitches - well his bump is bigger than mine!! I've started looking at baby things already - I have got most things from when Mister A was born but we had borrowed a crib last time so I have been looking online. 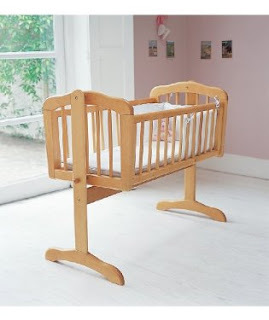 My favourite was the Mothercare Swinging Crib in Birch - at £75.00 it's not cheap but it is great quality.